F1 Asphalt: Alain Prost : Being quick will no longer be enough on its own, you’ll need to be quick and sensitive. Alain Prost : Being quick will no longer be enough on its own, you’ll need to be quick and sensitive. Renault ambassador and four-time Formula 1 World Champion Alain Prost spent a good chunk of his career driving big horse-power turbo engine F1 cars in the ‘first’ turbo era of the sport. He reflects on those days and looks ahead to the ‘second’ turbo era which begins in 2014. 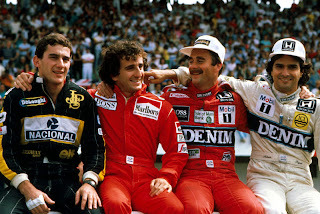 What was the first turbo era like for the drivers ? Alain Prost: If you go back to the start of the 1980s, it was all about response time : there was a lag of two to three seconds. We saw turbo engines develop every year, there were improvements between the first turbo engines in 1977 and those at the end, but throughout the period, the driving style was very different. You had to find the right moment to accelerate – and anticipate when the power would come through. Getting the timing right depended on a lot of factors : the type of corner, speed, grip, the type of tyres, how worn they were and how much the turbo had been used. For the drivers, there were corners where you definitely had to brake a bit earlier, so you could accelerate earlier, and therefore be able to have the required power at the right moment. That’s why there could be such big gaps between the cars, as well as drivers becoming tired towards the end of the race. Your brain had to process things differently. Will the use of turbocharged engines be different next year ? AP: When you look at the extent to which cars in general, and especially F1 cars, have developed from a technological point of view, there is no doubt that the turbocharged engines of the future will be very different. This is especially true because part of the power is generated electrically. We don’t have precise information about the response times as yet, but it will be very short compared with what we experienced in the 1980s. Will the drivers have to adapt their approach next year ? AP: Probably, yes. First of all, there will be a tiny lag, in terms of response time. I imagine it’ll probably be very small next year, but the drivers will nonetheless have to get used to it. But it’s not just a question of the turbocharger : the interaction between the combustion engine and the electric motors will also be very complex. The combustion engine generates around 600 bhp and the electric motors around 160 bhp, so power management will be much more of an issue than with the normally-aspirated engines used currently. The engines, and all the resulting energy use strategies, will be utilised by the engineers and the drivers in a variety of ways. In fact, it’s a return to an era when the driver will need to be strategic and very calculating in how he used his racing car. Being quick will no longer be enough on its own ; you’ll need to be quick and sensitive. Will engines become more significant again in 2014 ? AP: As soon as you freeze engine development, the chassis and aerodynamics become more important again. In 2014, the situation will be rebalanced. There’ll be a very interesting technical side to the sport, where greater emphasis will be again placed on engines. Whoever manages to get the various parts to gel most effectively will benefit the most and innovation will stem from good working relationships between the chassis and engine departments. And then the engines, and all the resulting energy use strategies, will be utilised by the engineers and the drivers in a variety of ways. In short, there will be new strategies that will increase the importance of the engines. On paper, it sounds perfect ! Are we about to see the start of a new era in F1 ? AP: Yes, I think so. Many people watching F1 are disappointed with the racing and the fact there are restrictions this year, even if they are subjective, and the engines are all more or less the same. In the 1980s, you have to say that the turbo engine years generated interest in F1: everyone was interested in this new technical challenge. It was also a bit of an emotional journey, insofar as huge developments were expected at each race. Many people are worried about the noise of the new turbo engines…what about you ?